A couple months ago my good friends, Elle & Dee, reached out to me to help create a décor plan for their new place. They were planning to downsize from their 2 bedroom apartment into a 1 bedroom, and needed direction on what furniture items to keep, and what to get rid of. When I asked them about how they wanted their place to look, they said they were looking for relaxing, cozy with a pop of color. One thing they stressed was they didn’t want that clutter feel. Knowing how stylish these two are. No literally, Dee is a stylist, and they never leave the house without looking dressed to a tee, not to mention, they do this on a budget! I knew I wanted to give them a space that made them feel aligned with their colorful, stylish personalities. What works? I love the warm color scheme, live greenery and the leather couch. It immediately made me think Boho Chic! What could make the most impact in the room and what are the pieces to focus the budget on? A new area rug was definitely on my list. Dee & Elle also requested additional seating, during our consult, so this was also a priority item. I thought that two Boho ottoman cubes would look amazing here because of the cozy feel. Quick tip, when working with smaller spaces, don’t over-furnish, it’ll make your room look cluttered. Ottoman cubes are perfect for providing extra seating and can easily be tucked away when you don’t need them. Accents pieces? I decided to go simple but bold. I knew I wanted to get new wall décor and extra throw pillows to tie the room together. I just needed a couple statement pieces. Boho is also about bringing lots of live plants indoors so I decided I wanted to add macramé plant holders with beautiful draped leafy indoor plants to add an extra layer to the space. Did I mention how much of a difference indoor greenery makes to a room? Big difference! Now this is a place I can definitely come home to! We bought the beautiful area rug and ottoman cubes from Wayfair. In case you want to shop this look, I linked items below. 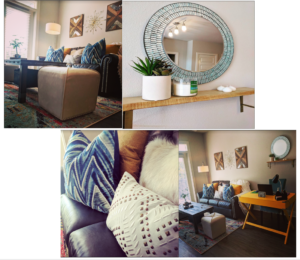 The silvery blue mosaic tiled mirror, mirrored wall art and wall shelf were all bought at Ross and the gorgeous set of blue down feathered pillows and chenille throw blanket we purchased at Home Goods. Everything else you see were pieces the homeowners already had! I forgot to mention the best part. Since Elle is a finance coach we were tasked to do this all within their budget of $500! It was tough, but we did it! The end product, Dee & Elle adore their new space! I could tell by their ear-to-ear smiles they truly were happy with the outcome. Not too shabby for a room refresher!